In the recent case of Yeatts v. Polygon Northwest Co., an injured construction worker in Oregon sued the general contractor for negligence after he fell 19 feet onto a concrete floor while working at a town home development site. General contractor would provide bodily injury insurance. General contractor was on site every day, conducting walk-throughs. 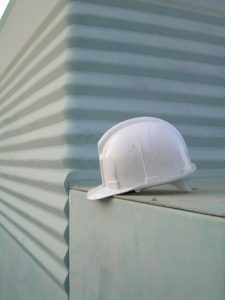 If safety hazards were identified (i.e., worker not wearing a hard hat), the worker or subcontractor would be called out on the spot and then the issue would be addressed at the weekly meeting with all subcontractors present. Subcontractor held a separate safety meeting each week. Plaintiff was injured while working as a framer on the project. He was instructed by a general contractor employee to put on his hard hat and go up to the third floor to finish something. There were guardrails, installed by the subcontractor/ employer, up at that location. Worker was kneeling and as he stood up, leaned on a guardrail that gave way. He fell three stories onto the concrete floor below, suffering severe injuries. Plaintiff filed a construction accident lawsuit against the general contractor. Plaintiff alleged general contractor was liable based on common-law negligence for failing to require and utilize a guardrail system that was effective in preventing falls. He also alleged the company failed to warn him he was working in an area where the guardrail system was inadequate. General contractor responded it was not liable because it did not control the guardrails and didn’t have a legal relationship with employee under which it owed him a duty to ensure his personal safety. Trial court granted summary judgment in defendant’s favor, but the state supreme court reversed on the grounds the general contractor reserved the right to control the area. The court noted that there was ample evidence the general contractor didn’t actually control the guardrail area, but because it reserved that right, plaintiff’s claim was sufficient to survive summary judgment. The case will now proceed.